On Saturday, Real Madrid will play Barcelona in El Clasico. The prize, ostensibly, is the Spanish Primera Division title. (If Madrid wins, they go seven points clear of Barca; lose and their lead shrinks to one.) Jose Mourinho will gesticulate. Pep Guardiola will walk around the technical area in a suit woven by actual angels. Lionel Messi will pinball around the pitch and Cristiano Ronaldo will make lots of sarcastic faces. 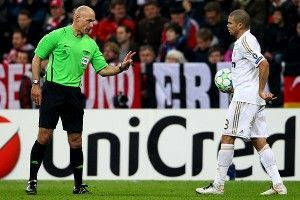 But the match could very well be decided by Real Madrid’s Pepe. It’s strange, considering all the Ballon d’Or winners and world-class attacking talent that will take the pitch Saturday, that everything — the league, the bragging rights, the soul of Spain, etc. — could hinge on the unhinged Portuguese international. But that, it would seem, is exactly how Mourinho wants it. it just so happens that he attacks Barcelona’s players, not their goal. According to The Guardian‘s Sid Lowe, some greet Pepe’s role in the midfield as a “moral aberration,” but Mourinho has obviously settled on the idea that the only way to stop Messi’s brilliant talent from blossoming is to scythe him down at the roots (or boots). And Pepe is the man with the machete. Make no mistake, this is a gamble. There is controlled fury and then there is having a thermonuclear device running around in cleats. As anyone who was watched one of the countless Clasicos over the last 12 months could tell you, this tactical maneuver has not exactly paid off. Pepe was red-carded in Barca and Madrid’s Champions League clash last season (for high-booting Dani Alves), stomped on Messi’s hand in the Copa del Rey quarterfinal, and has generally behaved like a freshly escaped lunatic whenever he’s been on the field. 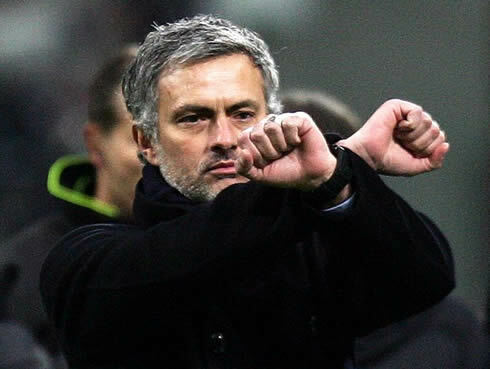 But Mourinho will likely have watched tape of his old team Chelsea defeating Barcelona in midweek Champions Legue action. He will have seen Messi pushed deep to pick up the ball, somewhat frustrated (you can only do so much) by Chelsea’s armada of midfielders and — because with Mourinho, anything can be seen as a possible advantage — he will have definitely noted Messi slipping and possibly picking up a knock at the end of the first half. Whether he plays as part of a central defensive pair, a central midfield three, or as some kind of freelancing doom merchant, Pepe will make an impact Saturday. Whether that impact will come from him being sent off the pitch, to the chorus of boos and whistles from the Camp Nou crowd, or because he has, finally, successfully negated Messi’s unparalleled attacking genius … well, we’ll just have to watch the bullfight and see.